More and more people are deciding to tie the knot in a tropical location, away from all the stress and high expectations often associated with having a traditional wedding in one's home country. With weddings getting larger, and therefore more expensive, there is a huge amount of pressure on young couples to conform to certain ideas and traditions, some of which are not necessarily the couple's own. It is on the back of such pressure and the financial burden of modern weddings that destination weddings have become popular as an escape and do something out of the ordinary. Islands are increasingly popular as a destination in which to get married. Thailand has become one of Asia's favourite wedding destinations due to the country's excellent hospitality industry combined with year-round mild weather and an excess of stunning locations. The islands of Koh Samui and Phuket have become especially popular due to their beautiful beaches and resort-like atmosphere. These islands have a kind climate and plenty of exotic, comfortable accommodation options to suit any taste. Bangkok is also a very desirable stop-over on the way and to and from the wedding, and perfect for bachelor and hen parties, with many world-class hotels and restaurants and easy access to services and vendors of all kinds. Everything that is needed, such as flowers, entertainment and catering, can be easily arranged via professional wedding agencies like The Signature Weddings. 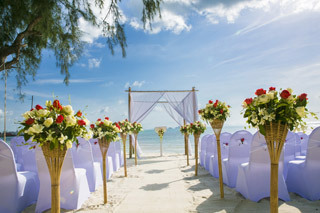 Planning a wedding on an island can be a bit more challenging logistically than holding the event at home, but wedding agencies such as The Signature Weddings specialise in bespoke planning so the couple need not worry about being in a different country where the preparations might be more difficult to arrange. 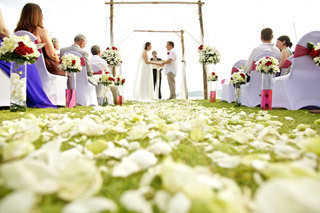 The Signature Weddings have a portfolio of outstanding private villas on both Koh Samui and Phuket which can be transformed into the most romantic wedding venues imaginable for both smaller and larger parties. Choosing the perfect villa can be difficult, but a team of dedicated staff can help narrow the search based on the specific needs and wishes of each individual couple. "Holding a wedding in a private island villa is the perfect way to celebrate the most important day of your life"
Location is not everything, however. That's why the team at The Signature Weddings offers guidance and support through the planning process and can arrange meetings with florists, caterers and entertainment providers. Through years of experience, the company has built up a large network of the best service providers in Thailand and they take pride in meeting even the most specific demands. "Using a professional wedding agency in Thailand means every detail can be arranged in advance"
If a traditional western wedding is not your idea of a perfect celebration, why not have a traditional Thai wedding, complete with a Buddhist ceremony with monks present? It is a perfect way to learn about Thai culture and Buddhism and The Signature Weddings can arrange it all for you.